Each golf disc has a distinct "personality" - the flight characteristics that make the disc unique. Flight characteristics have been broken down into 4 general categories: Speed, Glide, Turn, and Fade. Speed - Speed is the ability of the disc to cut through the air. Speed ratings are listed from 1 to 15. Glide - Is the ability to maintain altitude. Higher numbers mean more glide. Rated 1 to 7. Turn - Tendency to turn at high speeds. Negative numbers are easier for beginners, rollers, and tailwinds. Fade - Every disc will fade off in the same direction if allowed to decelerate. Higher numbers fade more than lower numbers. Candy-/Premium plastic will retain their flight ratings characteristics for a longer period of time. Basic plastic will start more overstable and with use will match the ratings. With continued use, the Basic plastic will eventually become more understable than the ratings. Understable means a flight that turns right (for a RHBH thrower). Stable is a flight that doesn’t turn. Overstable refers to a flight that turns left (RHBH thrower). Understable discs are much more speed sensitive than stable or overstable discs. An understable disc will often fly stable to overstable at low speed. Beginners tend to throw discs at lower speeds. Drivers are more pitch sensitive than Multi-purpose or Putt & Approach discs. Pitch refers to the nose up angle a disc is released with. Drivers thrown “nose up” or with an upward pitch will appear to fly more stable to overstable than they are actually rated. Beginning disc golfers tend to throw “nose up” shots. 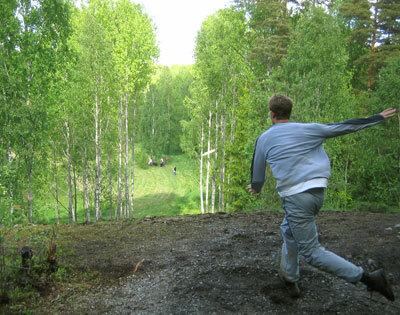 A throw on a downhill hole. The difference of altitude makes it even more important to know the flight characteristic of the disc. DX plastic is less durable then pro, champion and star plastic. Tree hits and gliding on asphalt gives the disc cuts and scratches that results in more under stability. On the other side the DX plastic has a great grip and feel. Typ Choose midrange if you're only gonna have one disc. Plastic Standard plastic is cheap nad has a good grip. Pro plastic is more expensive but has better durability. Stability Choose an understable disc. That makes it easier to throw straight. Color Doesn't matter. Maybe you will need to have i disc color that is easy to spot thought. Weight Choose a lighter disc - around 170 g or lighter. 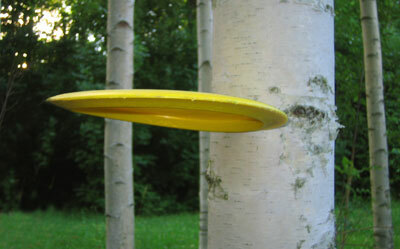 Ligther disc are more understable and have a better glide when thrown at lower speedes. Find beginner friendly disc here! Top to bottom: DX, Pro, Champion plastic. Notice the difference in lustre. The DX plastic is rough, the pro plastic is more polished and the champion plastic is completely smooth.